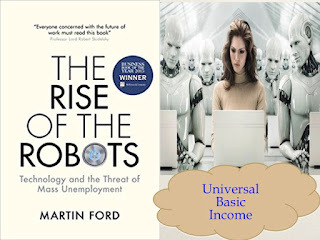 This review of Martin Ford's book, ''Rise of the Robots'' covers the past, present, and future development of robotics and AI, and their effects on the world around us. The technology world faces new trends frequently. New technologies typically promise to get things done faster, reduce costs, and open new market segments, thus improving the financials of a lot of firms. From Service-oriented Architecture to mobile and cloud computing, all of them stake their claim to deliver these benefits. However, the advent of Artificial Intelligence (AI) will impact the world economy in a way that no technology in the past was able to. This is the core thesis of Martin Ford’s 2015 book, 'The Rise of the Robots', sub-titled 'Technology and the Threat of Mass Unemployment.' If AI can unleash a tsunami of unemployment, how should America deal with it? Quite unexpectedly, Ford proposes Universal Basic Income (UBI) as the solution. In doing so, he ventures into economics, quite unusual for a book on technology. It is this mix of technology and economics is what make the book such a heady read. : "Robots are physical agents that perform tasks by manipulating the physical world. To do so, they are equipped with effectors such as legs, wheels, joints, and grippers. Effectors have a single purpose: to assert physical forces on the environment. Robots are also equipped with sensors, which allow them to perceive their environment. Present day robotics employs a diverse set of sensors, including cameras and lasers to measure the environment, and gyroscopes and accelerometers to measure the robot's own motion." So I guess Robots was used in the title because human jobs being snatched away by robots is the most visible and physical manifestation of AI. Secondly, the word makes the title catchy and appeal to a wider audience. The Rise of Artificial Intelligence wouldn't work that well. The key point, though, is that robots will do jobs that were previously done by humans. "A computer doesn't need to replicate the entire spectrum of your intellectual capability in order to displace you from your job; it only needs to do the specific things you are paid to," Ford writes. So, jobs that were previously done by humans and which were thought to be not doable by robots will also be taken away. The unprecedented disruptive force of Information Technology will put even white-collar jobs at risk. No field will remain unaffected. The book takes us through the impact on higher education and health care, and then through future technologies and industries. The one sector that may see a milder impact of AI and robots is health care. Ford writes: "Given that truly capable and autonomous elderly-care robots are unlikely to emerge in the near future, it might seem reasonable to expect that the looming shortage of nursing home workers and home health aids will, to a significant extent, offset any technology-driven job losses that will occur in other sectors of the economy". Problem is that these jobs are not enough to match the likely unemployment numbers. In addition, "these jobs are low-paying and not particularly suitable for a large fraction of the population." Throughout the book, Ford uses a lot of data drawn from diverse resources to back up his statements. In some cases, data are shown to illustrate that a certain trend has started. However, the hallmark of the book is it does not drown you in complex mathematics or jargon, and is written in a clear and lucid style well suited for the general audience. The book is sort of a primer for a variety of topics: Big Data, machine learning, nanotechnology, to mention a few. Martin provides a brief history of the development of these technologies. So, if you want to catch up on important topical technology subjects, this book is for you. But are these the ones what caused my peak interest? No, as undoubtedly the most fascinating one, the super-wow section of the book, was chapter 9: Super-Intelligence and the Singularity. To express pithily, Singularity is the technology tipping point. Ford discusses the concept of a truly intelligent computer system, one that has human-level intelligence, traces the origin of the term Singularity, and explains in detail the ideas of Ray Kurzweil. He also draws attention to the dubious side of Singularians and some members of the scientific community. Examples are immortality, digitally simulated actors, overwhelming first-mover advantage to some firms, making them uncatchable by their competitors, and so on. The one personality that caught me totally off-guard was Hayek. As I mentioned earlier, the book's rather surprising conclusion is that UBI should be implemented to deal with the rise of the robots. If that conclusion was so novel to me, the fact there is a Hayekian basis for supporting UBI was an eye-opener, which in itself was worth the price of the book. Friedrich Hayek is the neo-liberal champion of decentralized power and a staunch advocate of the competitive market system with freely adjusting prices. Hayek is well known only for his ideas on free trade and minimum governance. Ford quotes from Hayek's book Law, Legislation and Liberty: "The assurance of a certain minimum income for everyone, or a sort of floor for himself, appears not only to be a wholly legitimate protection against a risk common to all, but a necessary part of the Great Society in which the individual no longer has specific claims on the members of the particular small group into which he was born". Ford further adds that "the conservative argument for a basic income centers on the fact that it provides a safety net coupled with individual freedom of choice." Thus, the root support for UBI comes from Hayek. Well, if I hadn't read this book, I would probably not known about Law, Legislation, and Liberty and would have never gotten to know free-market economists' viewpoints of supporting the concept. Ford elucidates how UBI can be paid for. He suggests "limiting eligibility for the basic income to citizens and perhaps by means-testing it against earned income beyond a certain point," economic gains from a "consistent flow of purchasing power streaming to consumers", reform environmental taxes and making the tax system more progressive. As with other parts, the exposition here, too, is complete and comprehensive without any gaps. Ford refers to Moore's Law a few times and uses it to illustrate how computers have gotten ever faster and will continue to do so. For example: "...even without accounting for likely future improvements in their designs, machine learning systems powered by deep learning networks are virtually certain to see continued dramatic progress simply as a result of Moore's Law [pg 95 ]" and "once AGI is achieved, Moore's Law alone would likely soon produce a computer that exceeded human intellectual capability [pg 228 ]." But, is it still valid? Moore's Law is what came out of a 1965 article authored by Gordon Moore in which he observed and predicted that the number of components on an integrated circuit doubled every year. The prediction held until 1975 for transistors. Subsequently, chip manufacturers kept up with Moore's Law regarding the doubling part, but for various things, and a slightly longer duration than one year. Last year, Moore's Law was officially pronounced dead. As official as being headlined in an MIT Review article, Moore’s Law Is Dead. Now What? . My point here is, when Ford wrote the book, he did not foresee that Moore's Law would go so soon, and he uses it as a warrant in his arguments. By no means should he have foreseen that computing speeds would slow down. The quest for achieving faster computing per space unit will continue, and this will happen with forays into non-silicon non-Neumann computing architectures. The growth will be in non-Moore rates, and we don't know yet what they will be . Ford discusses IT outsourcing in depth. I was left wondering whether his explanation of off-shoring suffers from the broken window paradox. This is one part of the book that I had my misgivings on. The argument goes like this: In general, outsourcing is part of free trade and comparative advantage. But IT outsourcing is different as its benefits are one-sided. Hence, with regard to IT outsourcing economic principles should not be followed, and some form of protectionism is called for . In support of his proposition, he quotes Alan Binder, former vice chairman of the Federal Reserve’s Board of Governors: 'I do believe that the gains garnered by firms by I.T. outsourcing will help them invest in next generation technologies, focus on high-end jobs to be sourced by hires from local market and increase customer engagement by providing 24 x 7 support. These benefits have to be considered but not dismissed in that "measures in the aggregate and glosses over the highly disproportionate impact that offshoring has on the groups of people."' Today, when we are facing ban and reduction of the H1B visa program by the Trump administration, our policy makers and opinion influencers should be cognizant of conservatives' support to limited protectionism, as applied to I.T. outsourcing. In conclusion, I will leave with a quote from the book: 'Continued progress depends on a vibrant market for future innovations — and that, in turn, requires a reasonable distribution of purchasing power.' This one sentence captures the techno-economic essence of the book. Whether your interest lies on the technology side or you veer towards economics, it's a fascinating, knowledgeable and thought-provoking joy ride. Third Edition, Pearson India Education Services Pvt Ltd. 2015, Chapter 25, Robotics.